Urban Initiatives Junior Board member Kyle Smith shares his experience on a recent #UIJB Field Trip to Zoo Lights with the Kozminski and Lorca Work to Play teams! 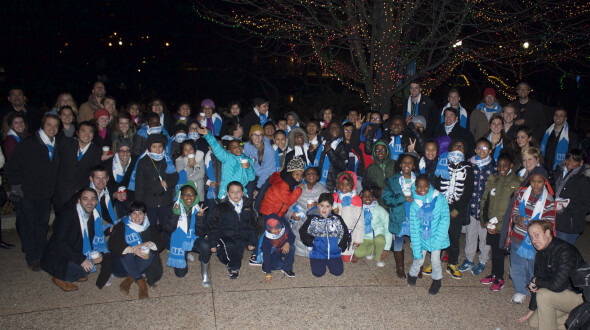 Friday, December 4th – Urban Initiatives and the Junior Board had the privilege to host Kozminski and Lorca for this year’s Zoo Lights! The Lincoln Park Zoo was poppin’ with families, love birds, high schoolers and everything in between. However, 40+ kids certainly made an impression to the fellow zoo goers as no one could contain their excitement. Once everyone split into teams we quickly shot off towards the animal exhibits. Saving the best for last, we skipped the Lion House and proceeded to the birds and reptile exhibits. Unexpectedly, in between exhibits, much of the conversation changed from animals to soccer practice, Friday games and school activities. To come to find out, many kids were in AP courses and actively dropping goals and assists in UI’s work to play soccer team. After checking out a few more of the world’s beautiful species we were all impressed with the dancing Christmas lights. The lights were appropriately synchronized to some of Christmas’s best tunes which reminded each of us of the chilly Chicago night and hot chocolate waiting in the cafeteria. The kids were soon chatting about their favorite animals, the ice sculptor and their favorite coaches and JB members all while satisfying some hunger with healthy snacks and washing it down with hot cocoa. Sadly, the night abruptly came to an end, concluding with a group picture. This picture wrapped up the groups camaraderie embodied by the kids that are affected by these activities. The pure joy that the kids exude is very rewarding and the communication that continues shows the on-going positive benefit of our after school programs. Certainly, one of the best turnouts from the Junior Board volunteers – Thanks for making it a memorable night for Lorca, Kozminski and myself.